~When you consider celebrated female drummers the first one that springs to mind is Megan White of blues rock band The White Stripes. Also well known is the Irish pop band drummer Caroline Corr of The Corrs. But people may not know that the late Karen Carpenter of easy listening band The Carpenters also provided drums as well as vocal harmonies to the band. As well as the aforementioned she also drums for her two bands :- Chairfight and Mesadorm. Now, all this experience has enabled her to carve out her very own drumming master class. 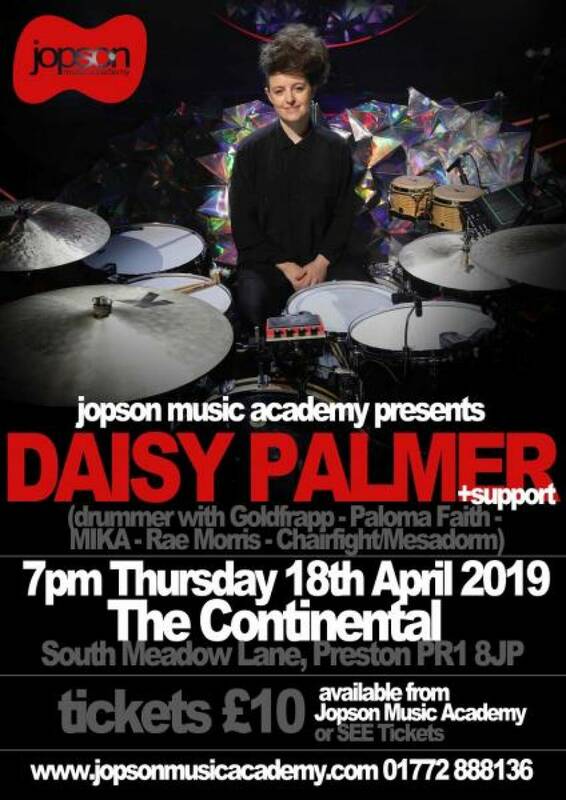 In association with Jopson Music Academy, Daisy Palmer will be delivering her drumming workshop on Thursday 18th April 7pm at The Continental, South Meadow Lane, Preston. Daisy plays Gresch Drums and Zildjian Cymbals.